This week it’s time to start some Christmas menu planning. Ok so now it’s December, I feel we can fully embrace the Christmas business and start getting some decent festive recipes under our belt. George’s birthday is at the end of November so I feel it’s wrong to focus on anything Yule related until after then. Now the jelly shots and red velvet cake have been finished it’s all about the Christmas entertaining. 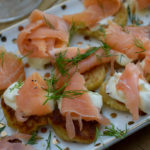 In a lucky turn of events, the super generous Fish Society sent me some of their fine smoked salmon to try so I used it to top these really rather tasty Potato Cakes. The Fish Society is an amazing on line fishmonger, delivering all your fish related needs. They have an enormous selection of frozen fish and shellfish available couriered straight to your front door. 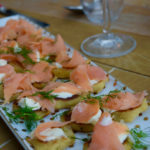 I was sent their FishRJumpin and Slow Smoked Salmons to try and what a tasty treat I was in for. Both have an elegant smokey flavour, are firm with none of the oiliness you find with lesser quality salmons and were incredibly moreish. 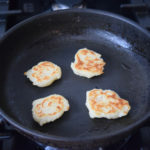 I didn’t want to mess with such a brilliant product so I used it to adorn these simple, but oh so delicious Potato Cakes. 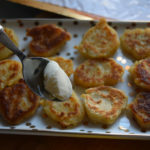 These are so easy, I am almost embarrassed to share them with you. 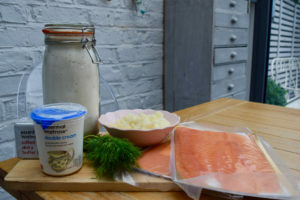 It’s just mash, flour, butter and seasoning, but these few ingredients create a special little vehicle for this wonderful smoked salmon. 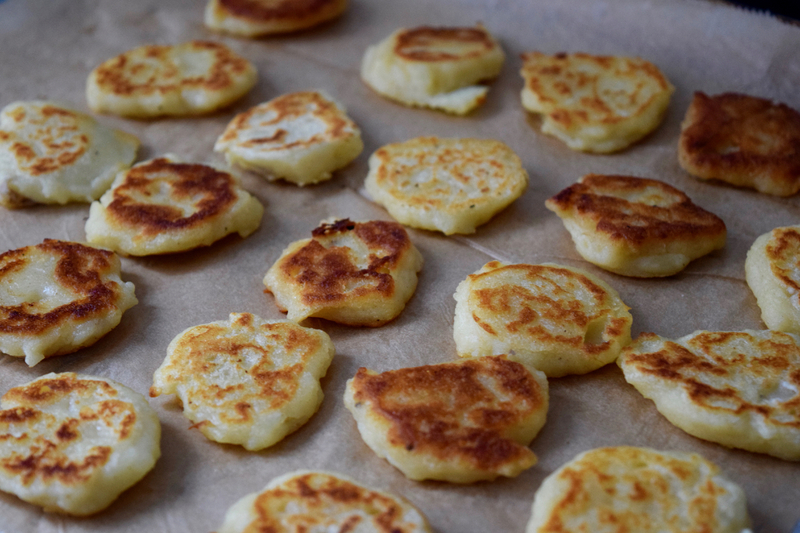 Top them with some creme fraiche or cream cheese, smoked salmon and just a touch of dill. I made tiny canapé sized cakes but you can make bigger ones to serve for brunch if you prefer. You don’t have to limit yourself to smoked salmon to top these Potato Cakes. Over Christmas you could use these for just about anything: bacon and avocado, goats cheese and chutney the list goes on. 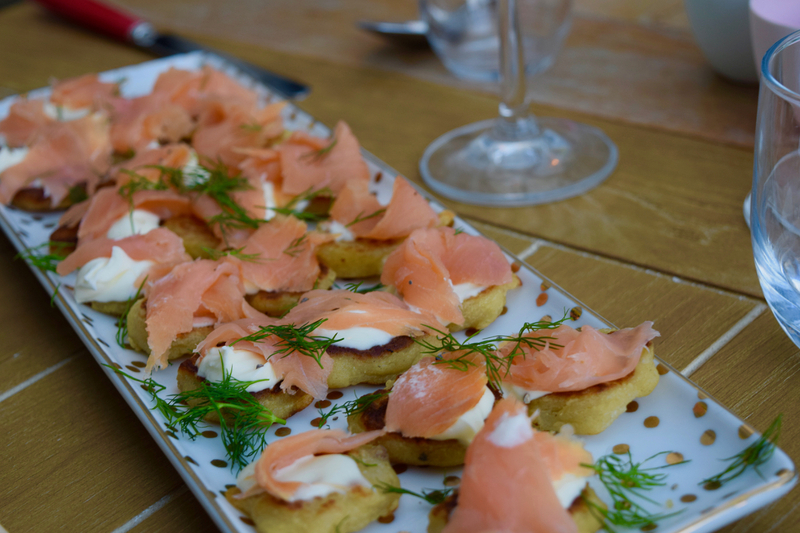 But I am a traditionalist and smoked salmon is a Christmas favourite, especially when it tastes this good. Huge thanks to Larder Love for this recipe. This is a gem of a Christmas recipe, a brilliant one to have in your collection. And an even better one to have in your tummy. Take a bowl and add the mashed potato. 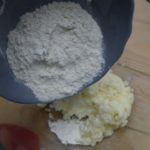 Tip in the flour, soft butter and salt and pepper and stir well to mix. 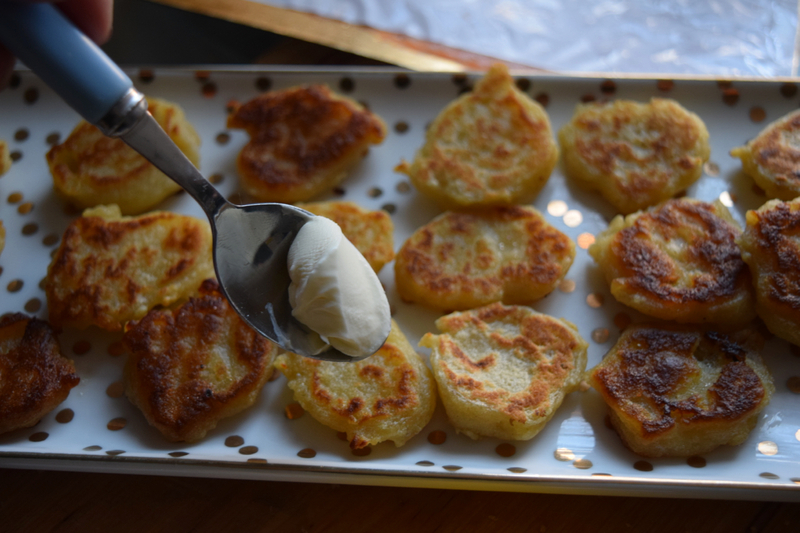 My potato was quite wet so I didn’t need any cream but if your mixture is too stiff add a tablespoon or two of double cream to loosen it. 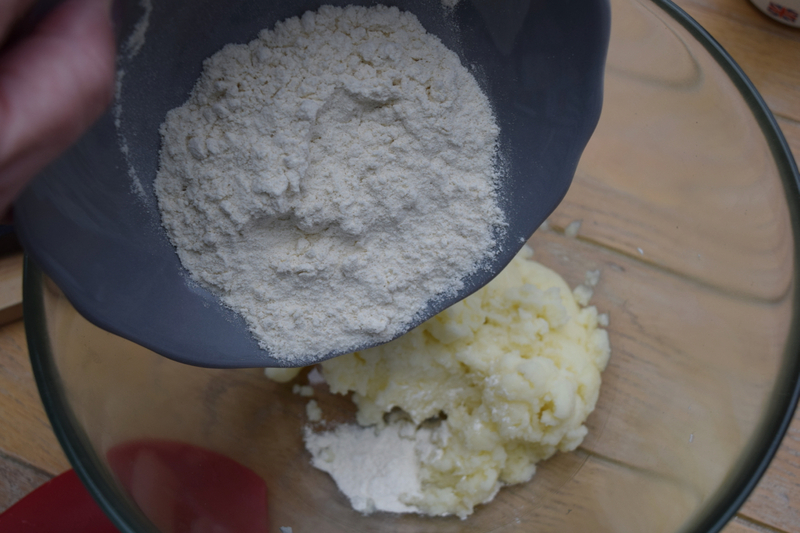 Take a small sturdy frying pan or griddle and add a dash of oil then wipe the pan with kitchen roll to remove any excess oil. 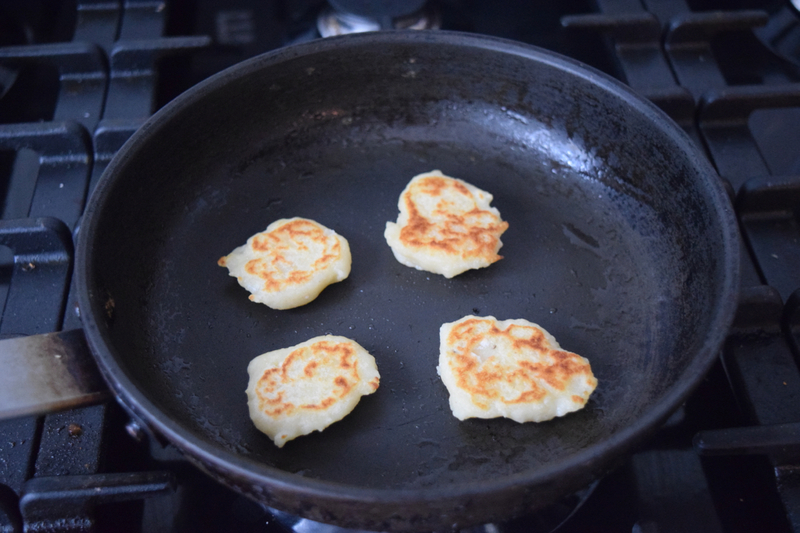 Heat over a medium flame then add teaspoons of your potato cake mixture and flatten slightly to form a small circle. Cook for around 2 to 3 minutes on each side, not moving so a golden crust is formed. 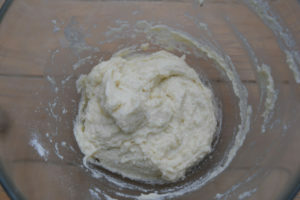 Continue until you have used all the mixture. 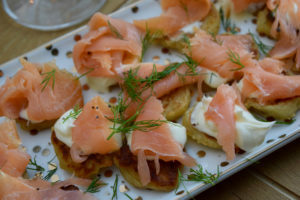 Serve whilst warm adorned with creme fraiche or cream cheese, smoked salmon and fresh dill or chives. 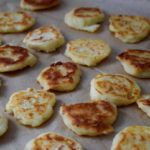 These can be made in advance and reheated on the day.